Top » Catalog » Modifications » Bolt-On Mods » sstWarpLED Bookmark Us! 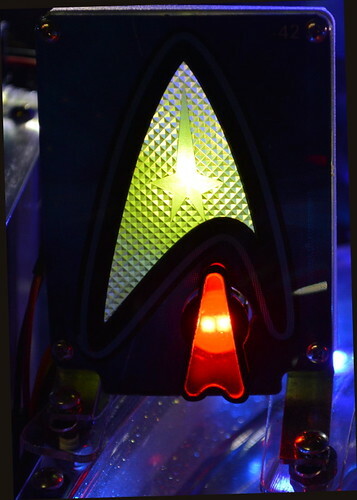 The Stern Star Trek Warp Ramp LED Mod replaces the two SMD round bulb LED with an Art accurate laser cut Arrow LED. Each Warp Ramp LED is handcrafted from a set of Black Opaque and Red Matte translucent Acrylic. 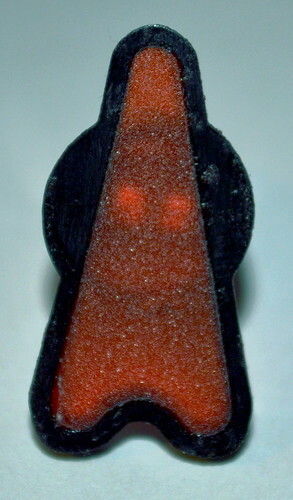 They are bonded together using acrylic solvent; then epoxed to a #47 Red 2SMD LED from Comet Pinball. The result is a rather striking difference vs the Stock LED. Details on the assembly process is shown here in our blog. To install this LED in the proper orientation carefully use the arrow to twist the #44 lamp base using a counter-clockwise direction (opposite of the clockwise twist to install the lamp). Twist the rotate-able lamp base using this method until the LED's arrow lines up with the art of the warp ramp plastic. Notify me when "Warp Ramp LED" is re-stocked.